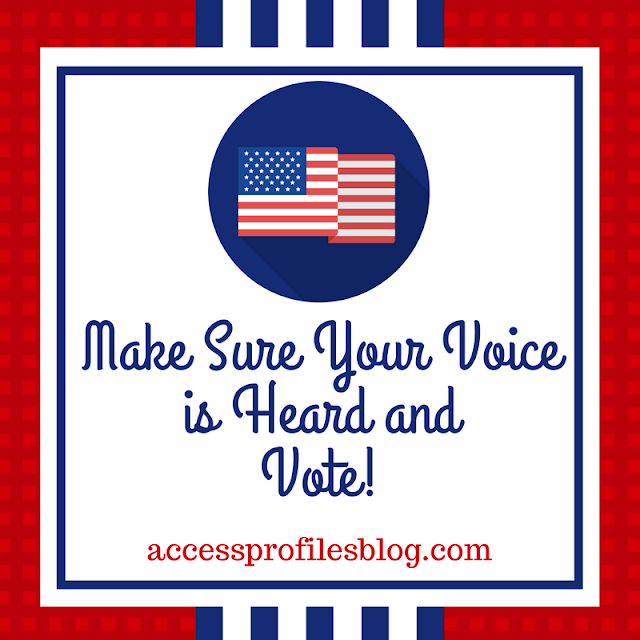 Voting is important as a way to get our voices heard and weigh in on what matters to us and our society. Our votes can effect change at the local level by helping elect township councils, court judges, and even school board members to work on our behalf to make our neighborhoods and schools better places. Casting our votes for statewide and national offices can do the same on a much larger scale. No matter what the stage, when we vote we are showing we care about the issues. For some of us, those issues center on ourselves and our families. But, for many of us, our concern is deeper. It goes beyond the issues that effect us personally and expands to those that can help make a difference to our fellow man. I believe that through our votes we can work towards creating a nation we want to live in. One that earns our loyalty and, most importantly, one where respect is based on merit. But, to make it work, it is important that we first become Informed Voters! Becoming truly informed is not always easy. Statements made by our politicians cannot often be taken at face value. Their behavior can take center stage and the important issues become clouded. However, while it may be hard, being informed is not impossible! “We need to do some research. Look at where the candidates stand on the issues, especially ones that are important to you. Find out their political beliefs or the way they have voted on or supported issues in the past. In other words, put in the work!”. Ultimately, it is our job as voters to dig deep and discover, as much as possible, the truth. Only then can we be sure we tried our best to do whatever it takes to understand the issues and how the candidates stand on each of them. But all the prep work in the world means nothing if we don’t get out and vote! There are some who don’t vote by using the excuse “what’s the use”? They think that our politicians only have their own and their “friends” interests at heart. Or they think that one vote simply doesn’t matter or won’t result in any kind of true change. While this can certainly seem true, it is now more than ever that we need to take a stand ~ and the way to start is through our vote! Vote those officials out of office that have proven they don’t speak for you and those they are sworn to represent. Make it clear that you will place your vote squarely for those that share your concerns. Then you need to continue to follow these elected officials. If they prove false in how they promised to vote or what they said they would do, then contact them. Hear what they have to say and express your feelings. And if they continue to disappoint, remember that in the next election! Our votes speak for us! They send a clear message to our government representatives about how we think they are doing their jobs. When we choose note to vote, we are tacitly accepting the way things are. 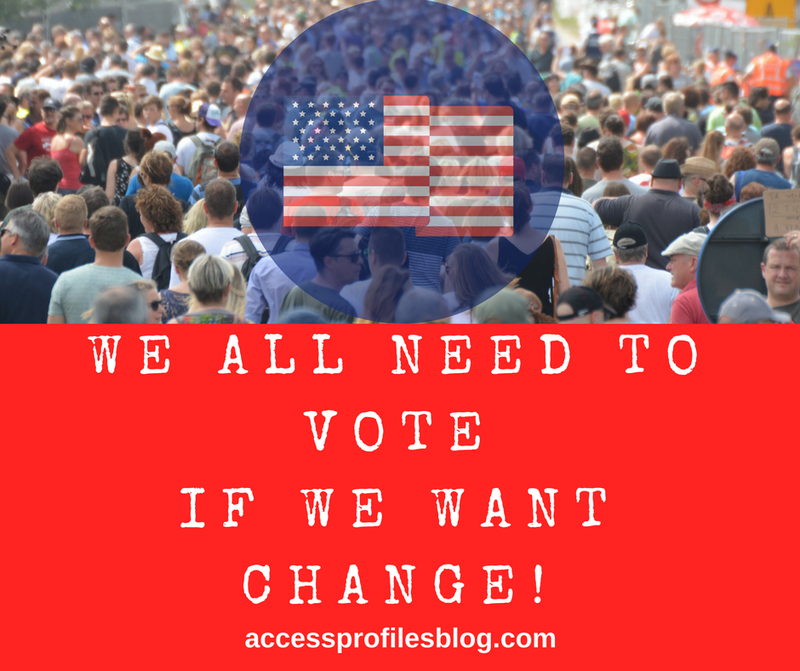 It is through our vote that we enact change. We are privileged in this country to have the freedom to vote. Since the age of 18, I have not missed an election ~ whether for our local representatives, the primaries, or for the President of the United States. And each time I vote, I still have a feeling of reverence for having the chance to exercise this right. My motto is, and will always be, if you don’t vote, you can’t complain! So this election, and for every election to come, make sure your voice is heard and VOTE! And find out what Our Clients have to say too! As an employer, it is your duty to provide your employees with a safe workplace ~ and that includes protecting it from workplace violence, drug abuse, bullying and harassment. It is also important that you recognize and understand why these acts and behaviors are dangerous to you, your workers, and your company! Workplace Violence and Drug Use. I also shared what you can do to lessen their impact on You, Your Employees, and Your Business. Employee theft is not uncommon. Billions of dollars are lost each year by employee theft, fraud, and embezzlement. And many times it is the employee that you least expect that is responsible. While workplace theft is harmful to any business, the effect that it has on a Small Business can be devastating. Learn more about the impact of employee theft on your company here! Workplace Bullying happens, and when it does, it can have serious implications on both the victim and your company. Victims of bullying are often plagued by health problems. They may experience elevated stress levels, changes in sleep patterns, and may even find themselves prone to panic attacks. Even more seriously, they are more susceptible to stress-related illnesses like high blood pressure and ulcers. Being bullied can also effect a person’s work performance. Many victims suffer from decreased self-esteem, resulting in them having difficulty making decisions. Their confidence is low. They may also experience a loss of motivation. Their work suffers because they can no longer concentrate. Frequent absences are not uncommon. Victims would rather not come to work at all instead of spending their day worrying what their bully will do next or doing everything they can to stay out of the bully’s path. Many times victims also feel a sense of isolation. They believe they are in this situation alone and that they have no where to turn. This is especially true of adults who feel that they are showing weakness if they are unable to handle the situation on their own. Check out this article on Workplace Bullying to find out more! Violent and Addicted employees pose a special danger to businesses. 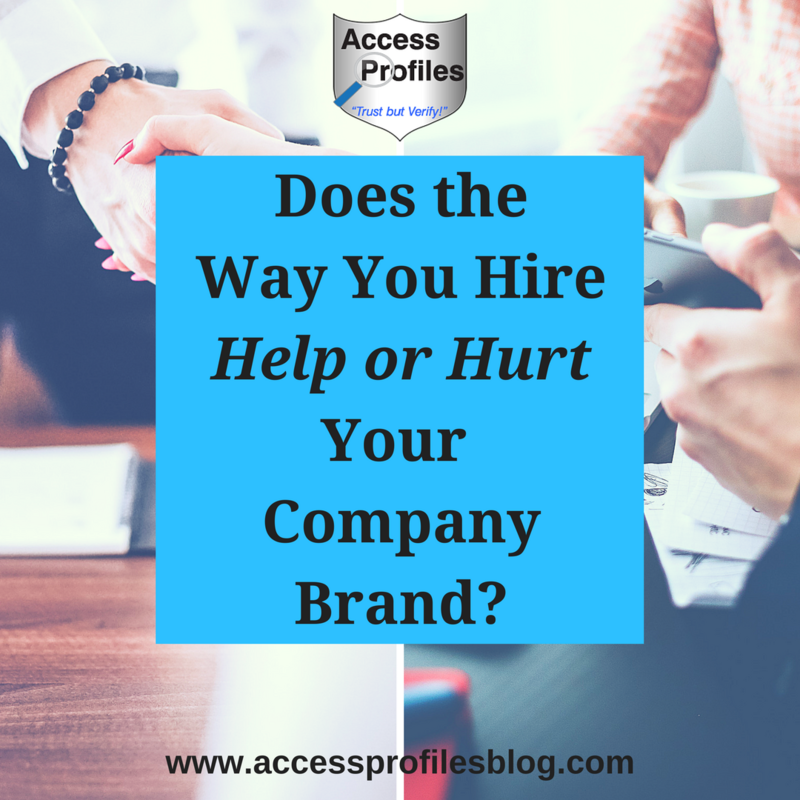 Not only are they a problem for your other employees and clients, they can have serious complications for your company. While violence in the workplace is not common, it can happen. And as an employer, it is your obligation to do what you can to prevent, recognize, and stop it whenever possible. Employee drug abuse can have serious implications on your entire company. When an employee is on drugs, they are often incapable of making sound decisions, on top of often being physically impaired. This can result in more on-the-job accidents and injuries, both for the employee using drugs and those around them. This can cost you both in harming your workforce and being dangerous to you financially. Discover the effects of Violent and Addicted Employees in your Workplace here! As with most business dangers, prevention should be your focus. Doing what you can before hiring any employee makes sense. And while not all dangers are completely avoidable, it is best to do what you can before something happens. Your First Line of Defense against a Violent Employee is the Background Check! 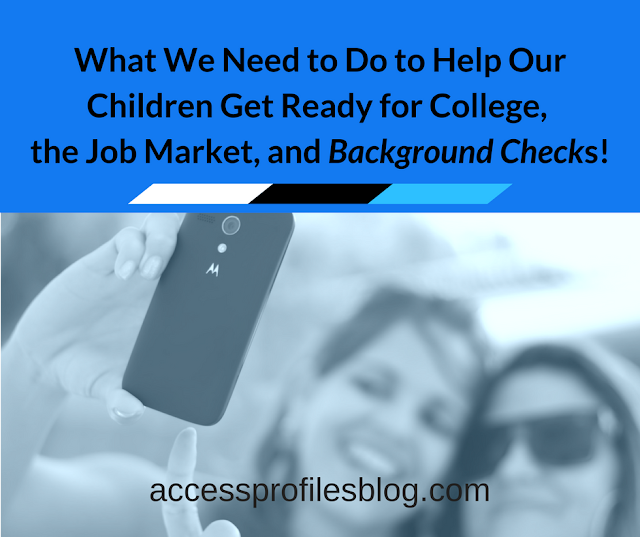 Background checks should be done on every employee before you hire, and periodic re-screening after. Remember, “Trust but Verify”! Write strong company policies with a zero tolerance for theft, bullying, violence, or workplace drug use ~ and make sure to discuss these polices with your employees. Get Everyone on Board with recognizing, reporting, and stopping unsafe behavior. Create a Safe Zone for reporting problems without repercussions. Establish a good checks and balances system so no one person has control over company finances. Form strong relationships with your employees. It is your duty to create a safe workplace. 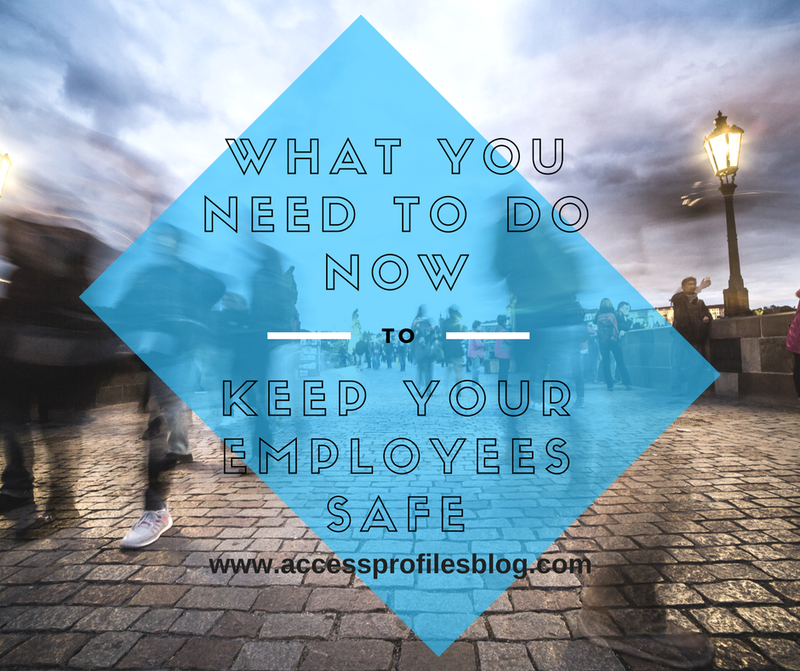 When you take the time to protect your employees, it shows that you are dedicated to making your workplace as safe and productive as possible. In the end, what it really comes down to is wanting the best for your employees and your business. And that is something we should all want! Let Us Help You make Your Workplace Safer! Contact API Today! We will work with you to better screen your potential and existing employees with our Background Investigation services. We also offer Security Consulting services that can help! Learn more About Us and what Our Happy Clients have to say too! Are You and Your Company Prepared to Tackle Tragedy? There have been hurricanes in Texas, Florida, and Puerto Rico. Massive wildfires in areas of Montana and California. And even the mass shooting in Las Vegas. We all find ourselves riveted to news shows and social media posts covering these stories. We follow the path of the storms and wildfires. We become saturated with information about the shooter and the victims. Even interviews with those effected are on 24/7. Many grapple with feelings of horror, helplessness, and anger. And it is impossible to think that these feelings don’t carry over into the workplace. It is even worse when the acts of violence or natural disasters directly impact one or more of your employees or occur within your own company. Stories of disgruntled workers who go on a rampage or ex-employees who return to exact some sort of revenge, while not common, do happen. 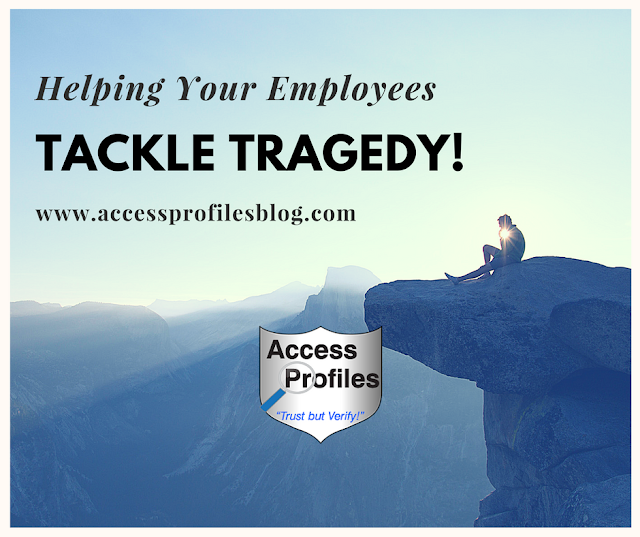 The bottom line ~ if a workplace tragedy occurs, it is sure have an impact on your employees. That is why it is crucial for you to be proactive and create policies to protect your workforce. You can start by prohibiting any type of weapon in the workplace and establishing physical security measures like controlled entry and strategically placed cameras. Adopting a zero tolerance policy for any type of workplace harassment and violence is also key. 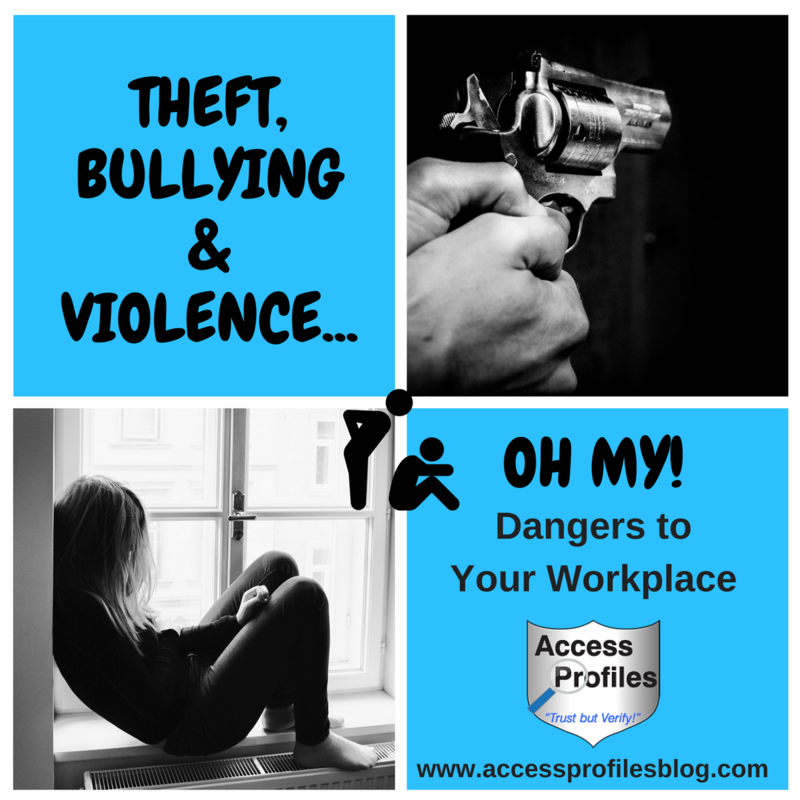 You can find out more about protecting your employees in “Dangers to Your Small Business Part 3 ~ Violence and Drugs in the Workplace”! But no matter whether it is violence that occurs outside or within your workplace or a catastrophic natural disaster, developing a plan to help guide you through, long before a tragedy strikes, makes good business sense. It is possible that your employees are effected both physically and emotionally by these incidents. While the physical injuries are most easily understood, it is often the emotional impact that can go unrecognized or untreated. So, what can you do to help your employees? It is important that you provide, or give your employees and their families access to, the support they need both emotionally and physically. Offer your support and, whenever possible, a chance for your employees to come together and share. What is most important here is that they know you care. This is especially important if the violence occurred within your workplace, close by, or involved family or friends. 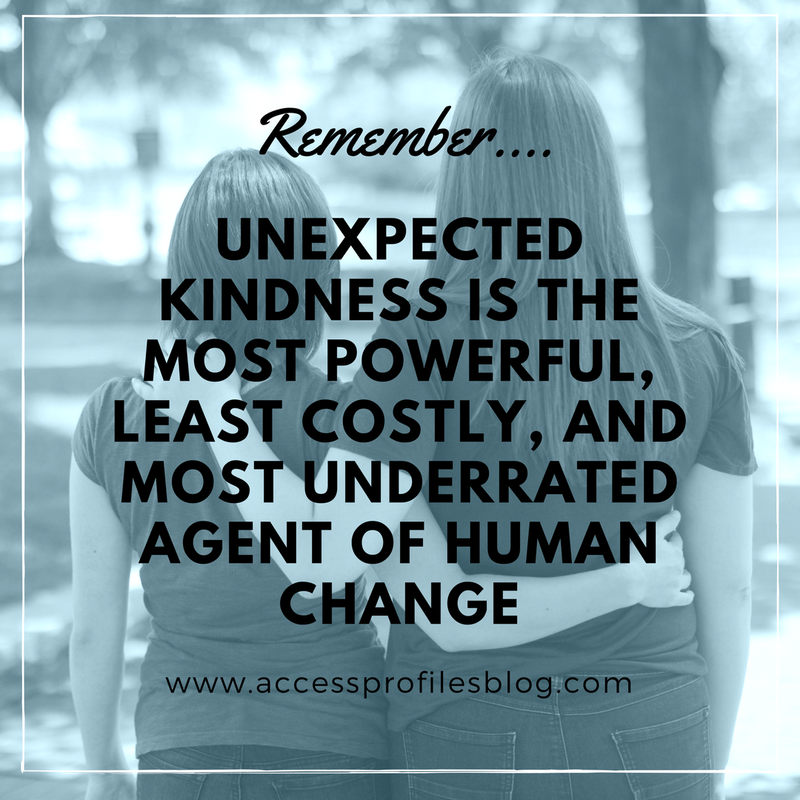 This can be essential for those who have been closely impacted by a tragedy. Organize efforts to donate time, supplies, or money to help those impacted. The key here is to find a way to work together as a team and help your employees, or even their families, feel more in control. Discover more about the steps your company can take in “What You can Do to Help Your Employees Deal with Tragedy”! No matter what methods you choose, helping your employees through a difficult time does good on many levels. It shows through actions, not just words, that your employees matter. That you empathize with what they are going through and truly want to help. In the end, doing what you can to prevent tragedies within the workplace, recognizing the impact of those that occur outside your company, and establishing ways to help your employees deal with both is simply the right thing to do. 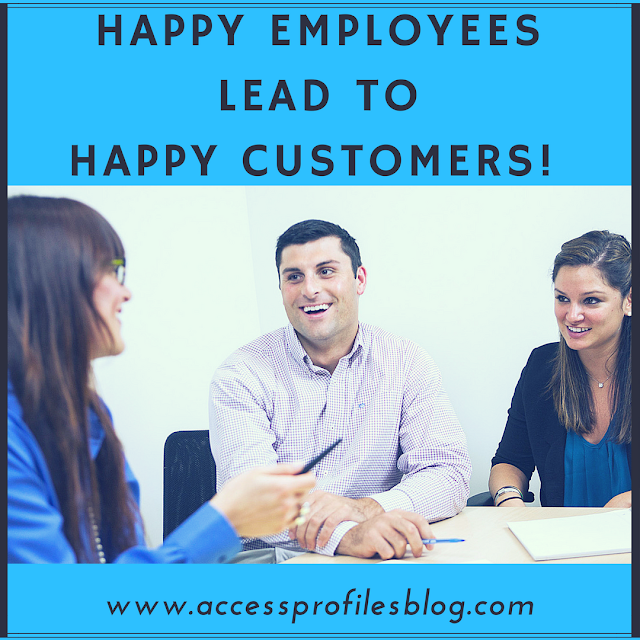 And that is important for both your employees and your business! Learn how we at API can help you keep your company safe. Visit our Background Investigation and Security Consulting pages. And if you need help moving your business forward, check out our Business Mentoring services too! 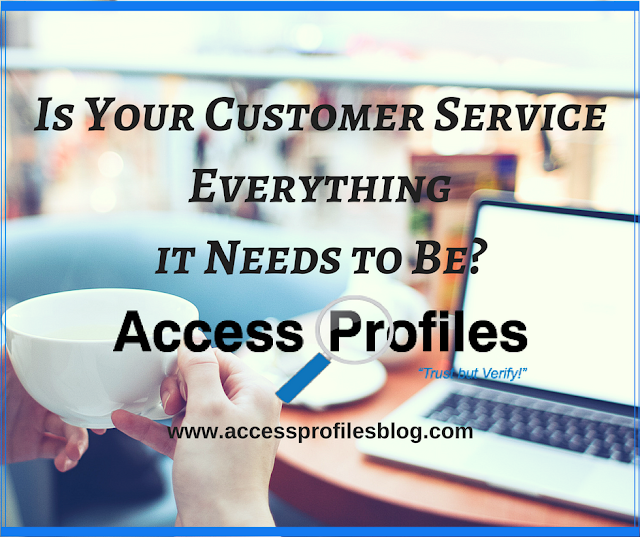 Is Your Customer Service Everything it Needs to Be? When it comes to getting new customers and creating loyal customers, there is no better way then stellar customer service. The way you and your employees treat your customers sets the tone for how your company is perceived. When done right, good customer service means your customers get their questions answered, their problems solved, and their needs met. And just as importantly, you have achieved your desired goal ~ delivering a great customer experience. However, if for some reason you fall short, you can suddenly find yourself with disgruntled, or even angry, customers, and your customer experience goes swiftly downhill! But it doesn’t just end there ~ Your Customers and Clients will talk! They will talk not only to each other, but on social sites and even, in some cases, to the Better Business Bureau. That is why it is so important that you do what it takes to ensure what your clients and customers say paints your business in a positive light! These 3 Customer Service Tips are sure to put you and your business on the right track! Dedicate yourself to making sure you are exceeding the needs of your customers and clients. Make providing a good customer experience part of your “story” and your brand. Study your competitors and find ways to set yourself apart. Do what they aren’t doing to attract and keep the customers you need. Establish an honest and straightforward relationship with each and every one of your clients from the beginning. Do what you say you are going to do, or make it right if you can’t. This is the best way to earn your customers’ loyalty. 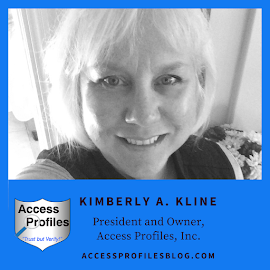 Discover more about how you can “rule” when it comes to Customer Service in “Focusing on Making Your Clients Happy is the Key to Success”. Customers expect their experience with you and your company to be stress free. They want what you promise and when you promise it. They want you to be true to your word. And none of that can happen without the cooperation and dedication of your employees! Creating a working atmosphere that appreciates your employees is the best place to start. You need to empower and value them. Listen to their concerns. Give them the tools to meet your customers needs. Recognize and reward them for their hard work. When your employees feel valued, that goodwill rubs off on your customers. So, the time is now to take a look at how you treat your employees and your customers ~ and make changes to any area where you are lacking. When you dedicate yourself to creating a good customer experience, Everybody Wins! And that is why focusing on customer service is simply good business! Find more articles with tips to help your business succeed in our blog. Subscribe Now to get one new article each month focused on you and your business! Discover more About Us and what Our Happy Clients have to say too! 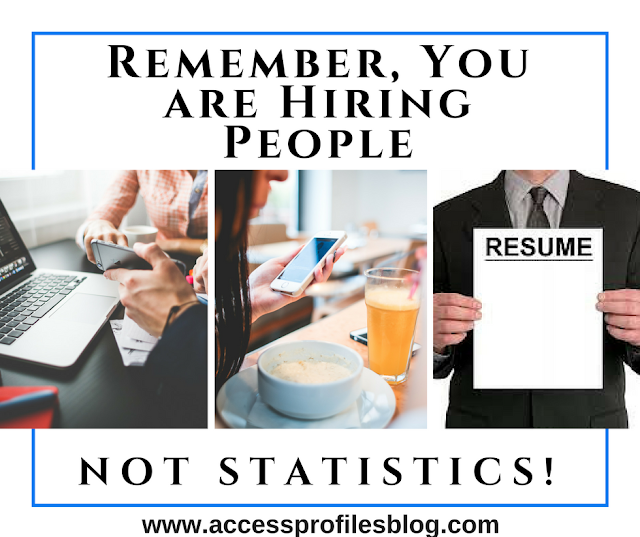 Why You Should Remember You are Hiring People, not Statistics! What does your current hiring system say about you and your company? The trend towards automation when it comes to applying for jobs is often to blame. Electronic resumes can be slow to download and the interface with the employer’s application can be confusing, duplicative, or even filled with errors. The problems then continue. Job seekers are not always informed their applications have been received. At times applicants are not even kept abreast of where companies are in the hiring process, if the job has been filled, or may not even hear back from them at all. This leads to a system that is often fraught with delays and non-communication. Instead of automation making it easier to attract the applicants you need, it creates a process that is impersonal, frustrating, and even downright miserable for many. Companies will argue that they have no choice. Expanding their reach is essential in finding a better range of candidates, and that results in the need for online applications. They will also cite the sheer volume of applications they receive. Without programs that search for key words and pre-determined skills, and weed out applications that fall short, they would never get to the next hiring step. There is no doubt that when it comes to hiring, automation has its place. It is undoubtedly the easiest way to quickly help employers weed out those that are unqualified for the job. Streamlining this process through automation is an invaluable tool. However, automation is often not the only cause of frustration for job seekers. Lengthy hiring practices also play a part! Many companies employ a multi-phase hiring process. There is the pre-screening stage (both automated and by hand). Those candidates that make it through this step are then often contacted by a recruiter or company human resource employee to set up an initial phone interview. During this phase the applicant will be asked questions related to their submitted application or resume. A select few will then be slated for additional interviews, with the final ones most likely in-person. Oftentimes these interviews are conducted by multiple company representatives and can last anywhere from an hour to a half day or more. Then starts the waiting game. Promises to the applicant that they will be contacted “soon” can drag on for weeks or even months. And many times the only updates given are when the applicants themselves reach out. This leaves many job seekers in limbo and unsure of where they stand. It is even worse if they end up not being offered the job. It can seem as if applying with your company has been a lengthy waste of their time. But while a reliance on automation and multi-step screening practices make the hiring task easier for companies, the question then becomes ~ At What Cost? What You need to know is Applicants Talk! They share their job search experiences, both good and bad, with each other online and in person. How does your company rate? Find out what is being said about you on various social sites. Take note of common complaints and reviews. This is a snapshot of your applicants’ experiences. Next, ask yourself this ~ Do these reviews of your hiring practices paint your company in a good light? Did they leave your applicants with a good impression of you and your company’s practices and values? Be honest with yourself and, if you find them lacking, take action. This means moving away from traditional, detached, and scientific hiring decisions and trying a more personal touch. It starts with treating people not as numbers, or as a statistic, but as individuals. What can You Do to Improve Your Applicant Experience? Put the “personal touch” back into your Hiring Process. This is possible even as you continue to use automation. Respond to all applicants. Continually update your job posts with where you are in the hiring process. Doing this will even allow those that don’t reach the next level to know where they stand. This is especially important when the job is filled or you have put your hiring on hold. Make your online applications responsive and easy to complete. Get experts involved in developing your system. Nothing is more frustrating for applicants then when your application doesn’t load or work properly. Ensure that your desired qualifications are indeed necessary to be successful in your posted job. Without this step you may be missing out on younger applicants or others with a diverse background. Be transparent about every step of your hiring process. Share with them an outline of what will happen and when ~ and don’t forget to update them if something throws a wrench in your anticipated timeline. These steps will go a long way towards improving your applicant experience and improve your company image! By taking the time to recognize your applicants as people, not numbers and statistics, you and your company will shine. More importantly, you will find that your improved reputation will lead to increased interest in working for you and your company ~ and this should be your ultimate goal! Learn how our Background Investigation, Business Mentoring, and Security services can help you! Find our What Our Clients have to Say too!